Microphone Polar Plot Sequence – Listen, Inc.
A sequence to measure the directional response of a microphone and graph the result as a polar plot. This sequence measures the directional response of a microphone and graphs the result as a polar plot. A log sweep stimulus is played from 100 Hz to 10 kHz at each angular increment, and the acquired waveform is analyzed using the Time Selective Response algorithm. This method allows the test to be performed in a non-anechoic environment by placing a window around the direct signal, eliminating the influence of reflections. Commands are sent automatically to the LT360 turntable via an RS-232 connection, instructing it to move in 10 degree increments after each measurement. The sequence measures the response every 10 degrees from 0 to 180 and mirrors the polar image, simulating a full 360 degree test while saving time. The response at each angular increment is compared against the on-axis response to create a normalized curve. 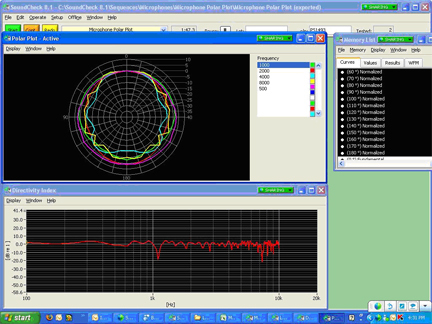 This removes the influence of the device’s frequency response and sensitivity, such that the polar plot only shows the directional response. The final display also contains a graph of the directivity index in decibels versus frequency. Connect Output 1 (or ‘L’) of the souncard to the input of the power amplifier. Connect the output of the power amplifier to the loudspeaker. Connect the reference microphone to the SoundConnect power supply. Connect the output of the SoundConnect to Input 2 (or ‘R’) of the soundcard. 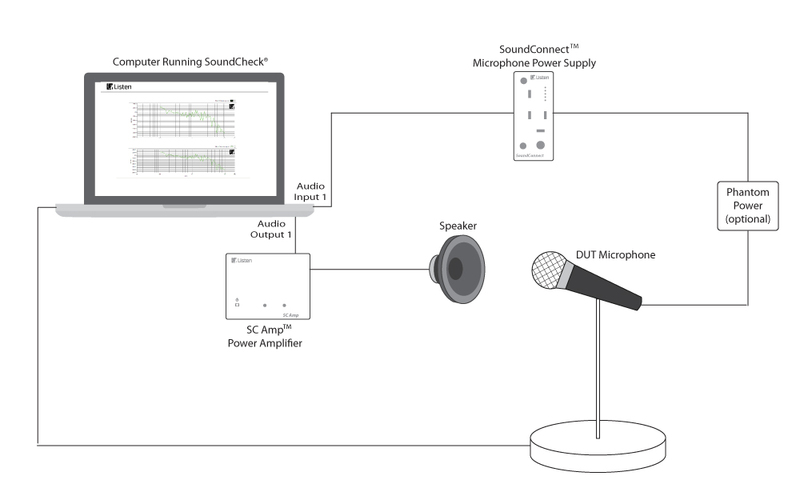 Connect the output of the DUT microphone to Input 1 (or ‘L’) of the soundcard. Calibrate the SCM-2 microphone as per the instructions in the SoundCheck manual. Position the reference microphone at the desired test location on the turntable stand. Calibrate the loudspeaker using the Simulated Free Field Calibration sequence according to the instructions in the SoundCheck manual. Position the DUT on the turntable stand at the calibrated position and ensure the turntable is at 0 degrees.